Preparing for your Week – Finding & Making the Time For Your Health! We can’t stress the importance of getting prepared when it comes to your food. It shouldn’t take a whole lot of time but preparing is important so that your week of food flows smoothly. The biggest reason people tend to fail when it comes to their temple of health and making responsible food choices, almost always falls on to the excuse of not having the right choices at hand, or running out of time. So often during a nutritional counseling session with a weight loss client, a sick client, or one just trying to improve their health, we will hear that it was too much work to prepare the right foods when they were hungry or it wasn’t convenient at the time. A good way to avoid the pitfalls and excuses to reach success with food is simply planning ahead. This will ease your week, and food routine and really help you make great food choices at all times. Although our household loves fresh prepared foods and meals, we always have cut, washed and chopped salad made in advance so that choosing the right choices is simple. Having chopped salad is not only a great option for making a salad but also is great for a sandwich enriching the meal with color and nutrition. Instead of grabbing expensive fast food or other unhealthy processed choices devoid of nutrition we are sure to have on hand sliced veggies, salads and other great and simple meals ready to eat. 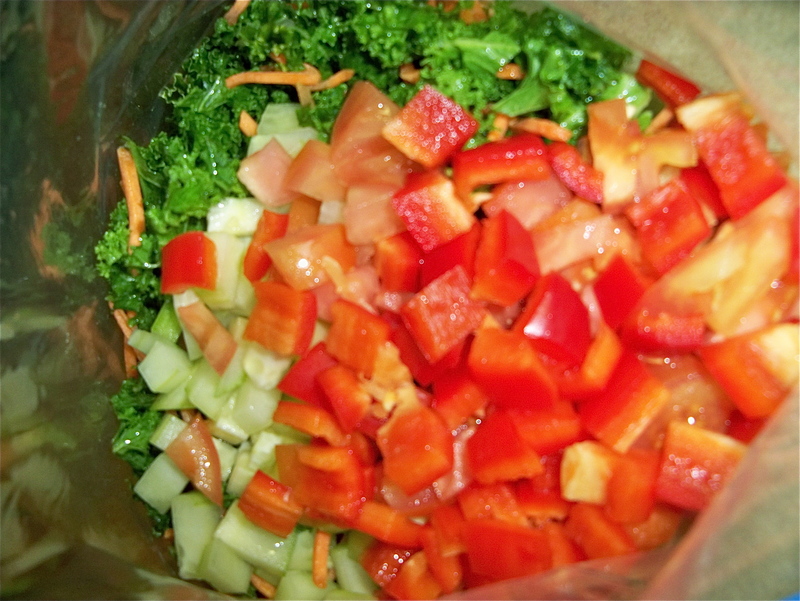 Making up the pasta with kale we featured and having it on hand as a cold salad works great. If you are the type that needs a denser higher calorie food available make up some pan seared tofu and or chopped chicken that is refrigerated that you can top on the pasta, add to a sandwich or salad and be done with it. This will considerably cut down your food prep time and make convenience faster then fast food and super affordable. One of our families favorites is taking cooked and sliced chicken in the fridge and the chopped up salad. All you need is some home made agave bbq sauce and bread and you have a bbq chicken sandwich in minutes. It will take longer to pull out a plate, then to make the sandwich or salad. Taking the work out of it and making it quick, easy and simple will help you make the right choices more often. 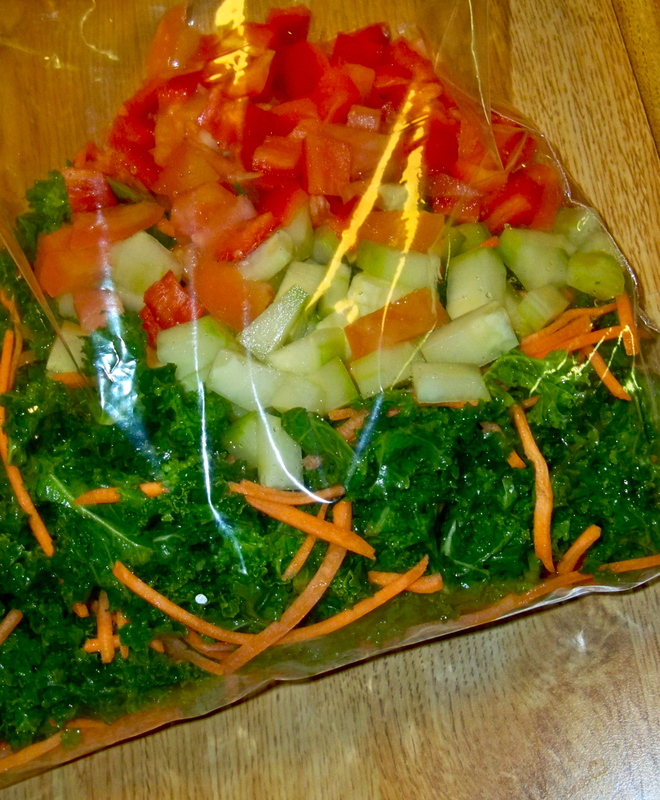 Our household designates a short bit of time on Sunday to wash, dry and chop up a large amount of salad that we pack up. It can easily be taken to the office or eaten at the house anytime. This also cuts the time down when preparing a healthy dinner, quick lunch, or great sides having healthy complimenting pieces to a meal that are already done for you. Make a rainbow in a bag. Although we are trying to rid ourselves of plastic bags and we have been washing and reusing the ones we have, we chop the salad up on Sunday for the week and we eat it until it is done, and then do it again when it is out. We will make up a couple large containers full of fresh salad, fresh chopped veggies for steaming, or soups, making it easier with food throughout the week. Try it and you will be surprised at how easy it is and how it really assists you cutting back on your food prep time and getting your healthy meals to the table faster.